Wae Rebo is the famous Manggarai's traditional villages. Precisely located at Satar Lenda, Satamese Barat district, Manggarai Barat regency, Flores Island of East Nusa Tenggara. The resident in Wae Rebo comes from Modo Tribe. This custom village ever got a reward from UNESCO for the conservation of culture heritage on 2012 years ago. The local residents still defend the tradition and culture from generation to generation. Wae Rebo itself has meaning as a spring and physically. Wae Rebo Village consist of 7 custom house named as Mbaru Niang. It has cone shape with diameter around 12 – 15 meters and 8 – 10 meters height. Path of the roof is dangle and almost covering all of the house. The house itself is made from certain grasses and coated by ijuk or palm fiber from the sugar palm in order to have strong condition as the wind and water attack the house. Wae Rebo Village is beautiful and amazing, covered by a thin haze all over the village makes Wae Rebo deserve the epithet 'town above the clouds'. Geographically the village is situated above an altitude of 1,200 meters above sea level. Wae Rebo Village also famous as ‘international village’ because among local village, you will find foreign who stay together with local village. The popularity of Wae Rebo has been spreading since UNESCO nominated the village as unique village in the world. It can be said that Wae Rebo is a new magnet to attract tourist from all around the world to come. 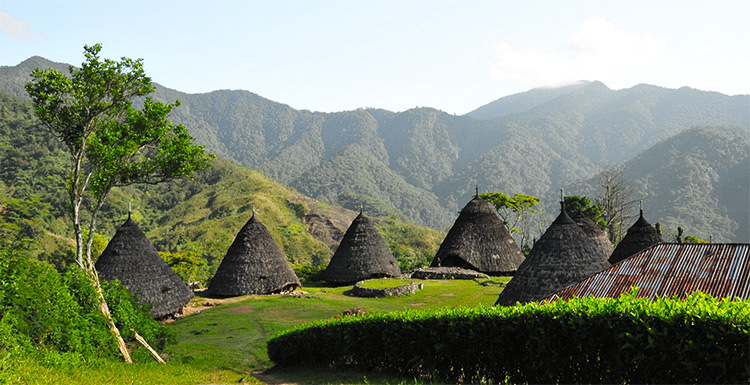 Wae Rebo Village is built on Pocoroko Mountain with 1,100 meters above sea surface and facing to Hindia Ocean. Besides having unique architecture and location, the pattern of the custom house of Wae Rebo also special because it has circle pattern and in the middle there is a rock with square shape. On this square spot, there is kind of altar made from bamboo named as Compang for custom ceremony to put the offering to the ancestor. In Wae Rebo Village there is a ceremony to welcome guest named Waelu Ceremony. The point of the ceremony is kind of welcoming the visitor and this will be done by the leader of tribe. They will welcome and pray for your goodness and safety during your visit to Wae Rebo Village. Perhaps, it sounds strange for foreign but this is kind of tradition and there is nothing wrong to accept it. To respect the custom and tradition in Wae Rebo Village, you are also suggested to wear proper dress. If you against this, the local residents may address you. Besides that, if you want to take the picture, you need to ask permission because sometime, they mind and will up set to you. One thing you need to remember is by bringing sweater or jacket because the atmosphere in Wae Rebo Village is hilly and it will be cool. Wae Rebo Village can be reached by the start flight from Ngurah Rai Airport in Denpasar to Labuan Bajo Airport, located in West Manggarai. Next you have to go through Ruteng city for about 4 hours, it is a small town in Central Manggarai district. During the trip you can enjoy a rice-shaped cobweb in Lembor or Cancar. After that the trip can proceed to Denge village that is the last village before trekking for 4 hours to Wae Rebo Village.